The Metro is a tough root cutting machine in a compact, lightweight package, at a price that’s easy on tight budgets. With 75 feet of 5/8″ cable it handles roots and other difficult obstructions in 3″ to 6″ lines – ideal for drain cleaners, plumbers, contractors and building maintenance. 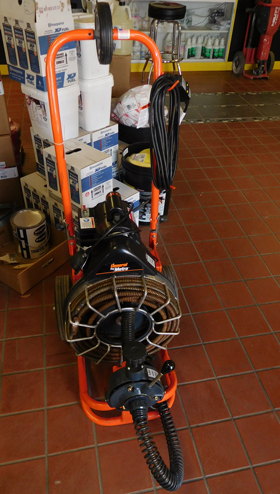 This easy to use, one-person operation machine is light enough to take down to the basement or up on the roof. The Metro has many of the features of the bigger capacity root cutting machines, including a variable speed Power Cable Feed that drives and retracts 9/16″, 5/8″, and 3/4″ cable at up to 20 ft. per minute. 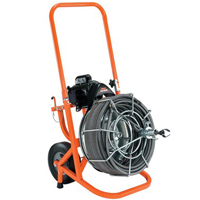 The heavy-duty powder coated steel drum holds 100 ft. of 9/16″ cable for inside lines, 75 ft. of 5/8″ cable for roots, or 50 ft. of 3/4″ cable for tough jobs. Plus, it features a unique self-aligning Flexitube™ distributor tube to reduce cable tangling. The Metro’s heavy-duty reinforced frame and drum support shaft takes rough handling in the field. The 1/3 hp capacitor motor has plenty of power to drive more than 100 ft. of cable. A passive brake system holds the machine in place on the job or in your truck. The ten-inch heavy-duty wheels and a truck loading wheel make it easier for you to transport the machine to and from the job. A cutter holder on the frame keeps all the cutters within easy reach. 20 ft. power cord and ground fault circuit interrupter. Power Cable Feed: Drives and retracts cable at variable speed without having to reverse motor rotation. Wheel brake: Passive wheel brake system holds the machine in place on the job and in the truck. Truck Loading Wheel: Enables one person to lift machine into truck bed. Cutter Holder: Cutter Holder on the frame keeps all the cutters within easy reach. Leather Gloves: For hand protection when guiding cable. 1/2″ diameter for 2″ to 3″ lines. The Metro’s Power Cable Feed is a real labor saver. It enables you to vary feeding speed in and out of the line, and gives you better control when working tough stoppages. Easily handles 9/16″, 5/8″, and 3/4″ cables.